Method are the makers of beautiful recycling bins for modern facilities. The NZ made Method 60L Office Recycling Bins fit together to make flexible recycling stations. Method’s award-winning recycling solution can be found in facilities around the world including Foster + Partners, the Design Council, the Sydney Cricket Ground, Qantas and more. With an increasing focus on corporate responsibility, more and more companies are keen to encourage recycling in the workplace. 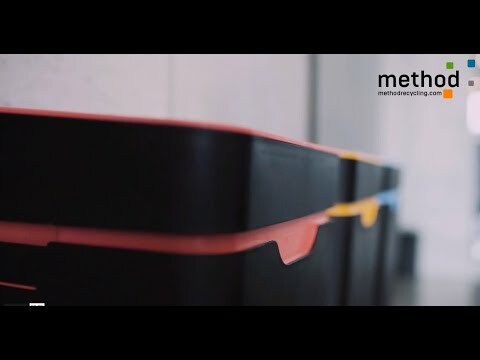 Method believes to promote effective recycling in office spaces; bins need to be visible, flexible and beautiful, while being accessible and aesthetically pleasing. Bins are available in open or touch lids (stream dependant), with a variety of waste streams and clear graphics to suit your waste providers requirements. Method bins demonstrate a commitment to sustainability in the workplace - a visual cue to help change behaviour for the better.